Traveling with kids? Be prepared with a few goodies to take with you. It's not hard to plan ahead. Here is a link to items you can print and play. Stick them in the car and pull them out as a surprise. -- Here are two different Car Bingo games. Each has 4 different cards with the items scrambled up. Print enough for each person to have one from each game. Pennies make good card markers, or you can print fresh ones for each trip and check off items with a pencil. They will also fit into a quart sized zipper bag you can write on with a dry erase marker. You may even want to print these game sheets on cardstock paper and laminate them, so you can keep them in your box of travel goodies so they'll last for several trips. 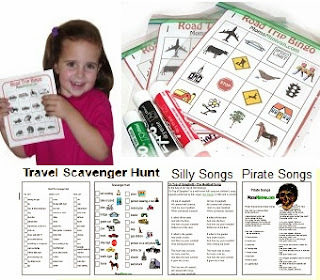 Lines and Dots Game, Tic Tac Toe, Travel Scavenger Hunt, Battleships, Sing Along Song Lyrics, Instructions for String Games, Crazy Eights and Old Maid, License Plate Game.